This week has been a little bit of a down time for me. Granted, few days of rest following a hectic weekend (2 long gigs over the weekend) is quite therapeutic, if it wasn’t for a fall on Wednesday night which landed me a busted right knee. Kelly and slippery floor don’t bond very well you know. I should really be crowned the Queen of Klutz. Luckily, the said knee was prompted iced, compressed and elevated. Today, the bruise still looks quite impressive but the swelling is gone. A wee bruise is not going to stop me from going to the kitchen, however. Ironically it was the last night trip to kitchen when the fall happened. I’ve considered putting the photo of my bruise up, but I think that might put you off your food. I suppose it’s perfect timing to ring in some comfort food today. Mum has recently brought me some dry Mee Pok from Sarawak. 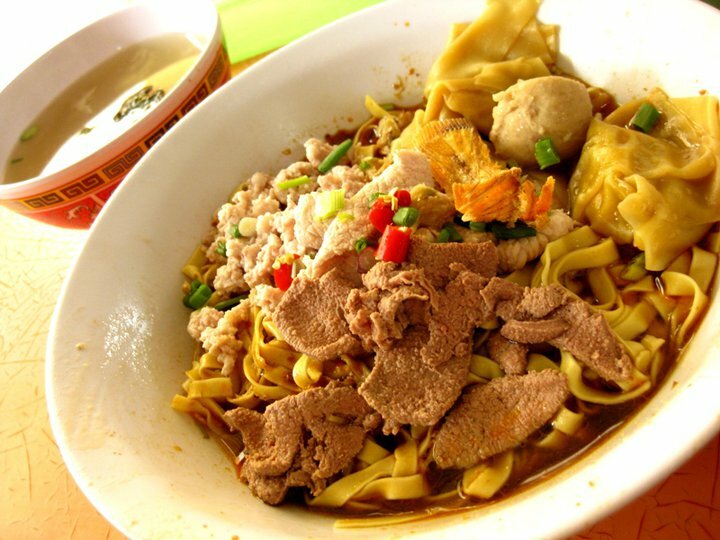 Mee Pok is Teochew in origin, and I’ve always preferred the flat noodles to the round ones. I know this is confusing but Mee Pok is used commonly in Sarawak for Kampua Mee. Whereas in Singapore, you often see this as Bak Chor Mee. Al dente noodles tossed in vinegary black sauce with minced pork, wantons, fish balls and sometimes pork liver. I crave for this often. And now I can make the same dish! Sometimes I wonder why I bother to go through all that trouble to make something I could easily get from a hawker stall or a kopitiam, often for cheaper prices too. But then, I think of bracing myself in the heat and the possibilities of getting nasty surprises (unhygienic food is one thing), namely the amount of MSG they put in the food, and all is good again. Truly, what more satisfying than being able to reproduce the dishes at home with just a bit of effort? Not having to worry about what people would think if I just venture out in a boyfriend’s Tee (*cough* and nothing else) is a bonus too. This is from a rather well-known Pork Noodles stall near Lavender LRT station, you can see how the bowl is loaded with toppings and even feel how ‘Q’ the noodles are by looking. The noodles come with the sauce unmixed and patrons would twirl everything around and devour the dish with contentment. And this costs SGD5, only. Compared to that, my version has less toppings but I suppose slightly healthier. There are quite a few steps involved in this, but if you are good at time management, it will somehow come together rather efficiently. So here’s what I did. First, make the fried shallot. Just brown the shallots in sufficient amount of vegetable oil and set aside. We’ll need both the shallot and the now very fragrant oil. In a bowl, dump in about a tablespoonful of shallot with the oil, follow by pork lard, soy sauces, vinegar and white pepper. Blanch the bok choy for a minute until soft, and shock it with cold water to retain the colour. Then, cook the noodles until al dente (around 4-5 minutes, test it before draining). And now this is up to you: some people blanch it the second time after rinsing with cold water. I just did a quick rinse and serve as I dive in immediately after serving. If you don’t rinse it the noodles tends to be a little sticky. Once the noodles are done, add to the bowl and stir around a little to mix with the seasonings, then finish with the toppings. 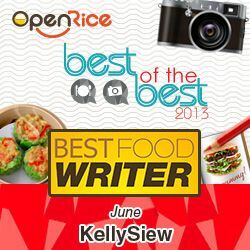 It goes without saying that the measurements of the seasonings are just a rough guide as it depends on your own taste and the amount of noodles. If you don’t have/can’t find Mee Pok, you could always use other types of noodles too. Ok, now I go back to bed to rest the poor knee. Queen’s Diamond Jubilee Street Party at Sid’s Pub Damansara Heights tomorrow. Must be better by then. Have a great weekend everyone! 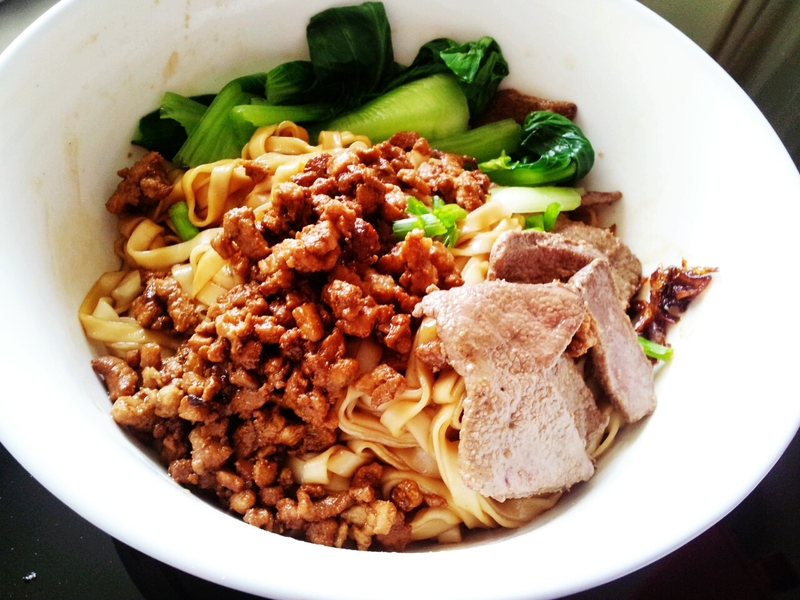 Do you like Hakka mee? It’s similar with pork mince and curly noodles. Haven’t actually tried it before but I heard it’s similar to our kolok mee. 😀 Gotta love the regional differences. And I actually miss food in Melbourne! Thanks! Best thing is that it’s so simple! I prefer the look of your bak chor mee more than one in Singapore. It looks delicious! I always think of chili for croomft food. Not sure where my mom got here recipe but I still use it and got my wife converted over from her recipe. Another is the wife’s fried chicken, best I’ve ever had. Man, I’m getting hungry just writing this. kelly this looks soooooooooo gooooooooooood!!! It’s amazing how a simple plate can be so satisfying right? Especially when it’s with pork. Oink! Wow! Where did you get the book? Does it have all these dishes we grew up eating?